Buckeye Processing & MRF, LLC believes that the recycling of materials is beneficial and necessary to protect and maintain the world we live in. Recycling materials like glass, plastic, cardboard, mixed paper and metal extends the life of a product by turning it into something else after it has been used for its initial purpose. Recycling reduces waste at the landfills which benefits the land and air around us. A materials recovery facility ( MRF - pronounced "murf") is a specialized plant that receives, separates and prepares recyclable materials for marketing to end-users and manufacturers. 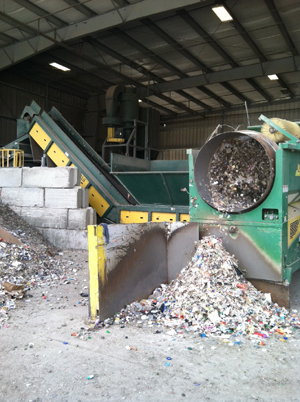 Buckeye Processing & MRF, LLC accepts a mixed waste stream and then separates out recyclable materials through manual and mechancial sorting. Some sorted recyclable material may undergo further processing to meet the specifications required by the end markets. 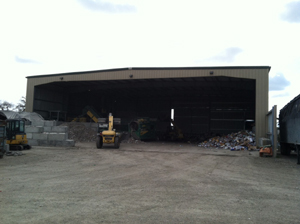 We then bale, shred, crush, compact or otherwise prepare the recycled material for shipment. Our company ensures that 100% of the mixed waste stream is subjected to the sorting process. We recover between 80% and 90% of recyclable material leaving only 10%-20% of residual going to the landfill.